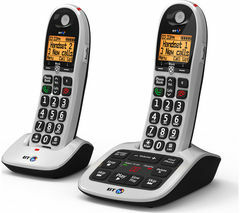 Whether you’re looking for a phone that does that basics or a phone that does it all, you’ll find the right landline handset for your home with our BT telephones. A corded and cordless phone range with all you need, choose from single or multiple handsets for use around the house, as well as a selection of styles, colours and features to suit you. 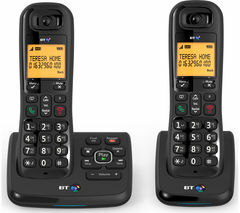 A leading name in telephony, the BT telephone range includes affordable, functional phones with reliably long talk time and battery life. Choose a corded phone for superior sound quality, with large buttons and speakerphone function for ease of use. The Decor Corded 2200 is also hearing-aid friendly. Or go cordless and you can walk and talk around the home or the office, and take your handset with you so you never miss a call. LED and LCD screens, brightly lit, and some in full colour, ensure that numbers and menus are clearly displayed. Choose a model with caller ID and you’ll always be able to see who’s calling, making it easy to avoid calls from unknown numbers. Most of our BT telephones also come with nuisance call block to give you enhanced call-screening power. You can use it to block specific numbers, groups or withheld numbers. Large built-in phonebook functionality allows you to store up to 1,000 contacts so you can get in touch more easily and never lose a number. You can also choose between models with and without built-in answer machine. These provide up to 60 minutes recording time, so no matter how long you’re away from home you won’t miss any important messages. Bases can rest on the countertop or be wall mounted to save you surface space. Whether you want a smart home phone that connects to your smartphone via WiFi, or you want to keep things simple, take a look at our complete range, including Panasonic telephones and Gigaset phones to get connected.